Description: Eurasian lynx are reddish-brown in summer and more grey in winter with a variable pattern of dark spots or lines. Their underbelly is white and they have long black tufts on their ears, a shaggy face, large paws and a short black-tipped tail. 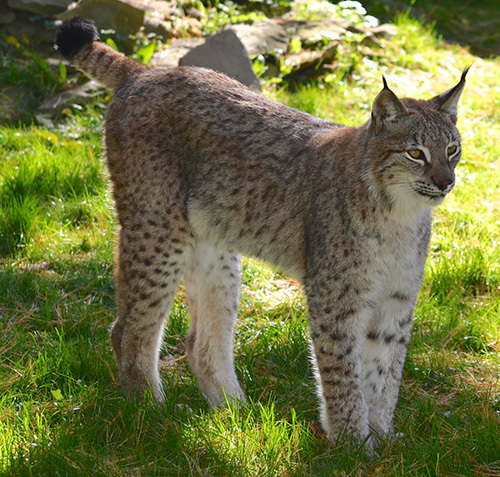 Taller and heavier than the Canada lynx, Eurasian lynx typically weigh 15-29kg (33-64 lbs). 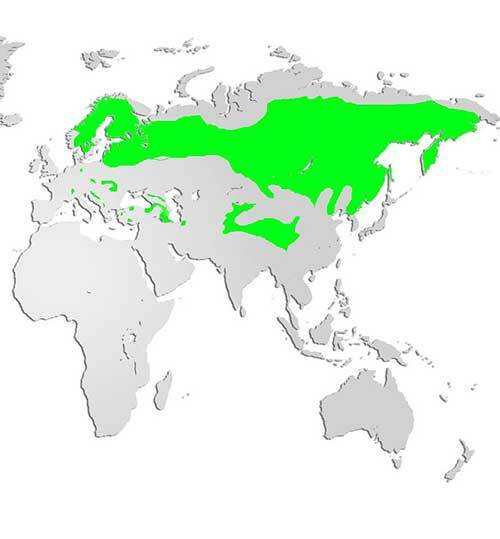 Distribution and Habitat: The natural range of the Eurasian lynx stretches across Europe, Russia, Siberia and into Central and Eastern Asia. Eurasian lynx are most often found in temperate mixed and boreal forests. Diet: Carnivores, Eurasian lynx hunt roe and red deer as well as wild pigs, birds, rabbits and other rodents. They can kill prey 3-4 times their own size. Life Cycle: These normally solitary animals will get together to mate from February to April. The gestation period lasts 67-74 days when the female will find a secluded den to give birth to 1-4 kittens. The young are weaned around 3 months but stay with their mothers until winter. Adaptations: Like the Canada lynx, Eurasian lynx have longer hind legs than front although the Eurasian lynx has far more stamina when chasing prey. Did you know? Eurasian lynx are the largest of the four lynx species and Europe’s third largest predator (after brown bears and wolves).